One standard sized bag with maximum dimensions (H+W+L) of 90cm or 35 inches with a maximum weight of 5kgs. 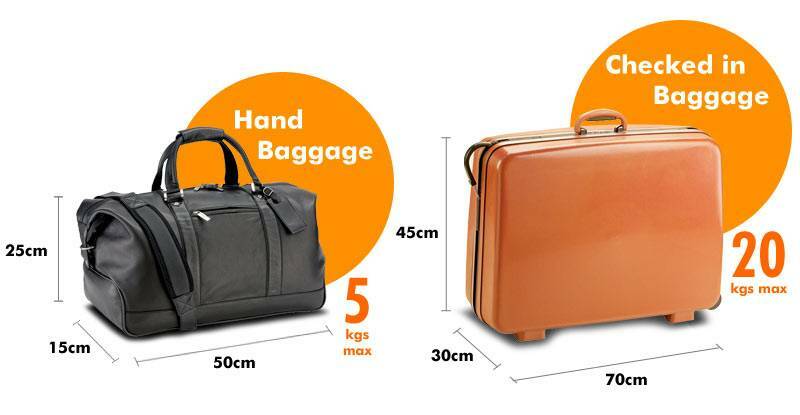 One standard sized bag with maximum dimensions (H+W+L) of 158cm or 62 inches with a maximum weight of 23kgs. Please note that large items ( for example skis, surfboards, snowboards, skis, bicycles, musical instruments, including cellos, guitars and keyboards) and certain other items cannot be carried. Skis, Surfboards, Sailboards, Golf Clubs, Windsurfers and similar items. Musical instruments (including cellos, guitars, keyboards and similar items). Wheelchairs (folding / non folding), Battery Powered Scooters. Bicycles (folding / non folding), Prams and Pushchairs (Non Folding). Weapons, Drugs (other than medicines), Solvents, Live or Dead Animals (other than as allowed under Article 2) Fish, Insects. Hazardous chemicals or substances as defined under the Health and Safety at Work Acts. Should a passenger present himself or herself for travel with any prohibited items, carriage will be denied unless the passenger properly and safely disposes of the prohibited item. Refunds will not be given to passengers who are denied permission to travel because they are in possession of prohibited items and are unable to dispose of them prior to travel.